Rich in antioxidants, blueberries fight free radical damage and keep you younger longer. 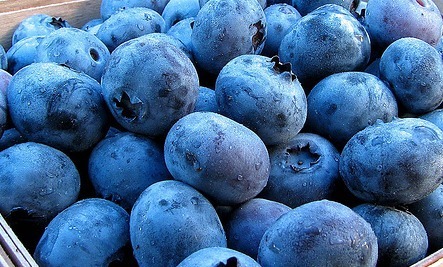 Research has found that blueberries can also reverse age related declines in motor function, balance, and coordination. There’s more: a single serving of blueberries gives you 25 percent of your daily quota of vitamin C.
Melt some dark chocolate over blueberries. Dark chocolate has been found to improve memory and concentration! Dot your salad with blueberries. Instant color + taste + health boost! Give them a whirl in the blender with vanilla-flavored yogurt. Pop some blueberries on your breakfast cereal. More power! Try blueberry salsa. Jalapeno, lime juice, salt, basil leaves and blueberries. Yummy! Tuck some blueberries into your French toast. Add a few blueberries to a glass of fresh fruit juice or mocktail. Dish up a delicious chilled blueberry soup—boil them with orange juice, sugar, salt and cinnamon. Cool and blend until smooth. Add half-and-half, and enjoy chilled. Native Maine IndianIndian blue berry: Rudraksha.